Fidel Castro successfully deposed the Cuban dictator Fulgencio Batista in 1959. It quickly became apparent to the Americans that Castro wouldn’t be another patsy like Batista. Batista fulfilled the model of Latin American dictators insofar as he promoted American big business and crushed any opposition. Batista went further. He also actively cooperated with the Mafia, facilitating the development of gambling and prostitution in Cuba. Castro was actively opposed to both American big business and the Mafia. As a result, successive American governments made numerous attempts at assassinating him in order to install a more agreeable regime. American imperialists subverted governments with a toxic mix of bribery, soft power, economic pressure and threats. Latin American dictators and presidents knew that the bottom line of American hegemony was a coup d’etat if they stepped out of line. American foreign policy itself is perverted by the iron grip that big business has on domestic politics. Dollar Diplomacy,* the brainchild of William Howard Taft (1909-13), is an unusally frank assertion of this fact in American foreign policy. Taft’s foreign policy ensured the continued pre-eminence of the United Fruit Company in Honduras. American commercial interests actively dictated foreign policy throughout the 20th century and probably continues into the 21st century. The Eisenhower Administration’s foreign policy reflected both the views of the demagogue senator Joseph McCarthy and big business. 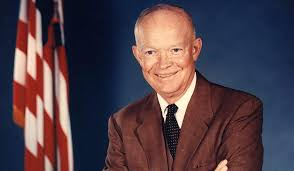 Eisenhower believed that the United Fruit Company in Guatemala was threatened by a supposedly pro-communist Guatemala government. President Guzman was deposed in a coup d’etat led and financed by the CIA because he wished to use unused agricultural land to the benefit of landless workers (1954**. Three years of revolution brought Castro to power. Ironically Castro personified revolutionary chic and he was feted by the public during his visit to New York (1959). Eisenhower immediately began plotting regime change. Regime change was embraced by John F Kennedy as he sought to promote American big businesses interests. Attempted regime change included 638 assassination attempts on Fidel Castro in the period from Eisenhower to Clinton****. Some of these attempts were outsourced by the CIA to the Mafia, a criminal organisation lest we forget. These assassination attempts reveal American subservience to big business. The most famous assassination and coup d’etat attempt is, of course, the Bay of Pigs fiasco (1961)*****. This was a crude, criminal attack sponsored by the Kennedy Administration. The symbiotic relationship between American big business and American foreign policy shouldn’t be under-estimated. From its crude beginning with Taft in America’s ‘backyard’, it has polluted their foreign policy until the present day. Regime change is a major strand in the promotion of American ‘interests’. The attempts on Castro’s life are a vivid example of a major theme in American foreign policy. *https://history.state.gov/milestones/1899-1913/dollar-diplo Their model could have been the British East India Company which in essence was the government of the hundreds of Indian states in the 18th and 19th centuries. Their rule ended with the so-called Indian Mutiny 1857. ****https://en.wikipedia.org/wiki/Assassination_attempts_on_Fidel_Castro Also in this period are the incidents in Chile with a CIA sponsored coup on president Allende (1973) and the financing of anti-government rebels in Nicaragua in the infamous Iran-Contra affair (1986). This entry was posted in History, Politics and tagged American Imperialism, assassination attempt, Batista, Bay of PIgs1961, Fidel Castro, Monroe Doctrine, President Eisenhower. Bookmark the permalink.